130 rounds L5 Style Magazine for M4 Series. 5 magazines included. Those look good, I'd put them in my M16. But I'm good with mags right now . True, but I'm sure plenty of people would want these. You can see how many rounds remain in the mag. That was my initial reaction too, but when I saw the PTW version of these a few weeks back (by another manufacturer), it occurred to me just how darn useful they'd be the way they are. I quite often swap out mags before a potential engagement when I'm unsure how many rounds I have left. At least this way I'll be able to make a better judgement call before I swap mags and bump mags forwards. It would have been nice if they were able to have the base be rubber like on the real ones, but so long as they feed well, I'll pick up a couple 5 packs of them. anyone seen these released anywhere yet? IIRC there was a problem with the followers too (quality control perhaps) Still these are probably going to be $50ish even if they are rubbish it's not like you're spending the amount that PMags are only to find out they fed like pooh. Watched Magpul Dynamics, I see? I'd like to see them with fake rounds. Would look very cool. Actually, that's something I've done for years. Maybe for about 15 years now. But it was good to see it on the AOTC DVD and to see that I was doing it right. Ooh, interesting. Some of Costa's techniques I've used for ages and some were complete surprises. But let's not make this a Magpul Dynamics thread. Is a good concept for the plastic killers in all of us, the ones who must know how much ammo is left. i too have always reloaded before engagements, when i wasnt sure of my rounds remaining, so this may be a good idea... and a lighter alternative to my metal TM standards. USCMCorps: next time we meet on the field, let me take a look at yours, so i can decide if i want them! Damn, these do actually look quite good. I might be tempted to pick some up when they arrive. Ehhh, never been happy with KA mags... I've owned the AUG, VN, and H&K-styled boxsets. In every set, at least 1-3 break through normal use, and none of them ever fed as good as my G&P or TM magazines. Given they are much cheaper, still not a fan... but those do look interesting! I hope another brand makes them. 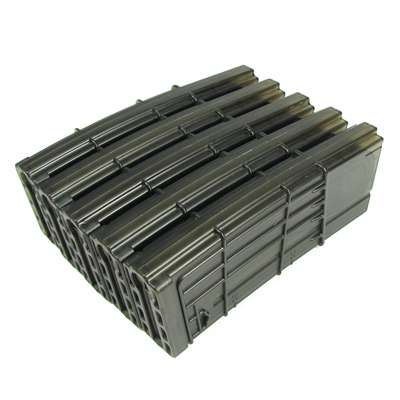 Also, I would love to a see a brand make a boxset of 5 or so different magazine styles... (H&K, PMAG, Thermold, Translucent, L5, Tangodown, etc.) all in one boxset. what a damn good idear. wonder how they'd run through my m4. anyone had any good/bad expericences whith these? I just received mine last night (2 boxes of 5 mags). Initial verdict is that they're great. • You can clearly see the BBs in the mag. • The ones I had fired every last BB in the mag! • What I didn't like about them was that they felt a little too slick. They do have a surface texture, but the ABS itself is kinda glossy and ... slick (can't think of a better word). • The other thing I discovered was that they have a plastic plug/screw at the base of the spring assembly that holds the guts in, similar to how MAG mags are designed. The problem is, that plug can come flying off ejecting the mag spring, follower, and all your BBs out the bottom of the mag. It's not really enough to just ensure that the plug is properly screwed in as the tabs on them tend to break. The best solution is simply to super glue the plug in place. Review and straightforward tutorial coming soon. Final opinion: So long as you fix the plugs on the bottom, which takes just a few seconds to do each, they're well worth the money, look cool, useful at seeing how many rounds you have left, and appear to be reliable 130 round midcaps. 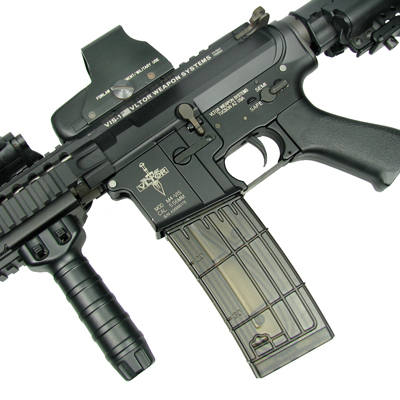 I posted a review of these over in the Tactical Equipment and Accessories Section. Check it out.